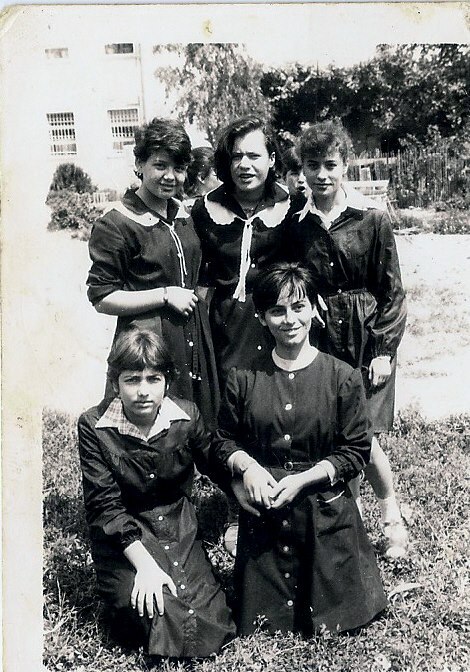 This is my story, the story of someone raised in Communist Albania, trying to break the cocoon of her life while the country broke from Communism. Fier, my city, came in existence during Communism. It was the center of the oil industry where my father was employed. Our neighborhood was made of one type of four or five story red bricks buildings, positioned in kind of squares to leave some space for kids to play. Our building was made for the oilmen. I was the daughter of one of them, like most of my childhood friends. In the evenings, the city would be covered by a dark mist that smelled ammonia due to the power plant that was a few miles away. Some people would whisper that that power plant had made us small and pale. My mother worked in the woodworking establishment and her job was to build wood containers that were used for vegetables and fruits. She had to build them from scratch, hammering hundreds of nails a day as they had to meet the daily quota of building 140 wood containers per day, for a monthly wage of $3 . None of my parents were able to attend college due to their family situations. My father had to become an adult overnight when his father passed away and he was the only in the family who could find a well paying job to take care of his mother and four brothers. My mother was offered a scholarship to study to be a teacher on the condition she remain in her village to teach, but her father refused. He wanted her not to be confined to their village. I had a passion for literature and from the first grade I was a passionate reader. My world was peaceful and there was joy, but the highest achievement my world offered me was to go to University and become a devoted Communist, which became my life dream. My brother was a talented soccer player who aimed to play for one of the main teams in our country. He distinguished himself from all his peers and his future seemed bright, until he was refused the right to study at the sports national school, even though his achievements for the entering test were excellent. My father wrote to those in authority, to no avail. “What did they tell you?” we asked him, as he entered home, his shoulders shrugged and face paled. “I could not do anything” he said. I had not seen my father cry before. Days later somehow he was told in confidentiality that our brother’s name was on the list till the last day when they had to replace him with the son of a well-known doctor in our city. We had to swallow that up and accept it in silence and total submission. What had happened should be a mistake. It could not be true; the system could not be corrupted. The Communist system protected and favored the working class. At least this is what we always believed. Seeing my brother perplexed as his life dream was crushed was one of the most painful journeys we had to walk through. I felt what it meant to have been born in a working class family and my dream to go to University seemed even more unreachable. I was one of the top student at my group but the right to study at University and major were arbitrarily given by the local Communist authority based on biography and GPA. Who would speak on my favor? I had to study harder than most of my peers, whose parents weren’ t from the working class. Ironically, my close friend was one of those; the daughter of a respected lawyer who held an important position in the city bureau, she was transferred from another high school to ours. She was very friendly and faithful and we became friends from the beginning. The system enforced GPA to become our invisible enemy, but our friendship prevailed over it. We were close buddies. On Saturdays we loved to go to the center pedestrian street to see the university students. They would come home every weekend and we would admire them from afar, while dreaming that one day soon we would be one of them. We wanted to break our city cocoon and fly out like them to a brighter future. What would the future hold for me if I did not go to University, but the random order of life: get a job and get married to the best match make presented to my family by a friend or relative, just like the daughter of our neighbor across our building, who got engaged to an older man, less handsome than we would imagine for a beautiful young lady like her. New and strong winds swept Albania in 1989-1990, which caught most of us by surprise, leaving us insecure and in panic. In shock we would get news about the fall of the Berlin wall, the demise of Ceausescu in Romania, and later would watch in horror the monument of our Communist leader Enver Hoxha thrown to the ground, tied with a rope and dragged in the capital city. Protesters were talking about freedom from dictatorship. What freedom and dictatorship were they talking about? Weren’t we the happiest country in the world? Weren’t we a free and sovereign country as our communist leaders would proudly tell us from their podiums? Events rolled like a roller coaster and we had to adjust to a new reality. There was joy, excitement, and chaos. In the fall of my senior year, a group of foreign students visited my school. Crowds of students would come out of their classrooms to see these rare species. We had never been allowed to come close or talk to those few foreigners that would dare to visit our country in the past. And now we could shake their hands, touch them as if to prove they were real, let them speak to us and talk to them. We had very important questions to ask them. Instead of Madonna and Michael Jackson, they introduced me to a strange Persian man, named Bahaullah. They talked about God as if they had met him in person, while Communism had taught me from childhood that God did not exist. I was a proud product of evolution, and science was my best advocate of that. I had so many questions to which I could not find an answer to please my curiosity and intellectual search, but my heart would tell me that there was something more then mere evolution. I could not prove it yet, but there should be a God up there. By the end of my high school I found a job as a translator in a Greek company which was promising as it would give me the opportunity to travel abroad. At that point I was not sure what was wiser, to keep the job or go to university, but I applied for the university entering test, and left the decision for later. My father brought me the news. I had won, classified 18th out of 200 students who had qualified. At last I felt hard work had pay off. That night I could not sleep. I was happier than I had ever been, and scared more than any other time as I found myself at the crossroad of deciding for my future. What would I do with my job? Was it better to stay or go? “-We want you to go to university,” – my dad and mom would tell me the next day. “-Rudina go, this is a wonderful opportunity, it is a gift from God,”- would confirm Sotir, the president of the company where I was employed, who was kind of a father to me, too. I left home for University on September 15th. My dad came with me. When he left I cried. I did not know that another Father had already preceded me and had paved the way for the most dramatic and exciting revelation. I, the child of nobody, in my battle to become someone by going to University and be successful, had just started the journey of knowing the One who would call me His child and who had paid the ultimate price for me . I am excited to read the rest of your story! I will be in Albania in June for the Cru Sbbatical conference. I am excited to come back. It has been 12 years since I have been there! I miss my brothers and sisters there! It was so great to hear from you Ron! Kejdis and I look forward with joy to meet you in June. Please keep us updated on your schedule. I will send you our email on fb. Have a wonderful and blessed weekend!